Facebook will help you keep tabs on your friends’ children, careers and concerts, but it won’t tell you when your freshman year college roommate is at the cafe just around the corner, and it can’t let you know that that stranger at a cocktail party is actually your sister’s best friend. That’s news you can use, and a growing number of social discovery apps are here to help. These apps marry your online social networks and information about your location to add an additional layer of data to the world around you. Services like Foursquare, Expreem, Swarm, Connect, Tinder, Path, Ban.jo, Highlight, Circle, Social Radar, Skout, Badoo, Zoosk and Sonar are meant to spark serendipitous social connections between you and the people around you, or help you more easily get together with people you know. ● Interact with local activities, add your content depending on your proximity, follow updates, make deals…and much more! ● Easily share your moments for as long as they are real: it’s a revolution. ● Help you to connect with people face to face in real life: welcome to expreem. ● Discover places around by activities, categories and by who’s right there right now! Our tastes are different, so why should we get the same search results? The new Foursquare learns what you like and leads you to places you’ll love. Foursquare is all about searching and discovering great places, wherever you are in the world. • Tell Foursquare your favorite things and it gets to know you. Every search is tailored to your tastes, your past ratings, and picks from friends and experts you trust. • Leave tips to share your best discoveries. Pay it forward and earn expertise. • Search for restaurants, coffee, nightlife, shops, and more. See what’s nearby or plan ahead. • When you arrive at a place, see insider tips: what’s good to order or something not to miss. • Follow people and influencers whose tastes you trust, and their tips show first. Connect your Facebook and twitter accounts and see spots your friends have liked nearby. - Want to meet up with friends? Quickly open up the app to see who is out nearby. - Want to share what you’re doing? Checking in is faster and more fun than ever. - Got an idea for something fun to do? Easily message all of your nearby friends. Connect instantly finds your friends and contacts on Facebook and other social networks – mapping where they are and what they are doing in real time. Now getting together with friends for a drink, movie or just to hangout is a snap! See what all your friends are doing and where they are without ever opening up Facebook, Google, Linkedin, Twitter, Instagram, Foursquare or even your phone contacts. You’ll see the last location each of your friends checked in at and all the posts they made on their different social media profiles. There’s no need to jump between five different apps just to see what all your friends are doing; your friends’ locations and their activities are all in a single spot with Connect. More than just a friend finder, Connect is about expanding and developing your existing relationships. The activities tab shows you what your friends are doing when they check in their location. No videos you don’t want to watch and no links to articles you don’t want to read. If you’re in the mood for hitting that popular restaurant at happy hour, simply open up Connect, see who’s already there from all your social networks and drop them a message to save you a seat. No more endless scanning of news feeds and check in posts just to set up a hangout. Connect makes socializing convenient and easy. With Connect, you’re able to communicate through different social media channels while staying within the app. You can send a Facebook message, Linkedin message, text, call and email straight from the Connect interface without pulling up each app separately. The convenient search tool also lets you filter friends and contacts by job, company, school, interest and more. Search up a partner by his company and touch base through Linkedin, Facebook message a friend who posted about a local concert and call your mom when she checks in at the airport without ever switching apps. You shouldn’t have to search through your Facebook, Twitter, and Foursquare accounts just to see who’s available to hangout. See what all of your friends are doing from all of your social networks and stay in touch while on the move. At Connect, we believe that you are the relationships you keep. More relationships mean more opportunities and Connect helps you develop both. The Connect app lets you tap contacts from all of your social networking apps at the same time. Why divide all your social contacts into seven different apps when you only need one to reach everybody? Download Connect today. SocialRadar gives you real-time information about the people around you. Know who’s around. See how you’re connected. Discover what they’ve been up to. All while controlling your privacy on one beautiful app. Imagine walking into a room already knowing there are 4 co-workers, 2 college friends, and 3 friends of friends nearby. And that one of your college friends just got engaged and your co-worker was just promoted. It works by combining your phone’s location info with the chatter from your social networks. Most importantly, you have total control over your privacy. You can share your information publicly, just with your friends, be anonymous, or be invisible. Badoo is a social network where you can meet new people. With over 200 million users, Badoo is great for chatting, making friends, sharing interests, and even dating! It’s free and easy to use. Find new people near you now! Want to have lunch with someone new? See who’s in the same nightclub? Date or find love? Or simply chat with someone nearby? Path is simple, ad-free social networking. Designed with the people you love, your closest friends and family, in mind. Path is a trusted, intimate environment like your dinner table at home. 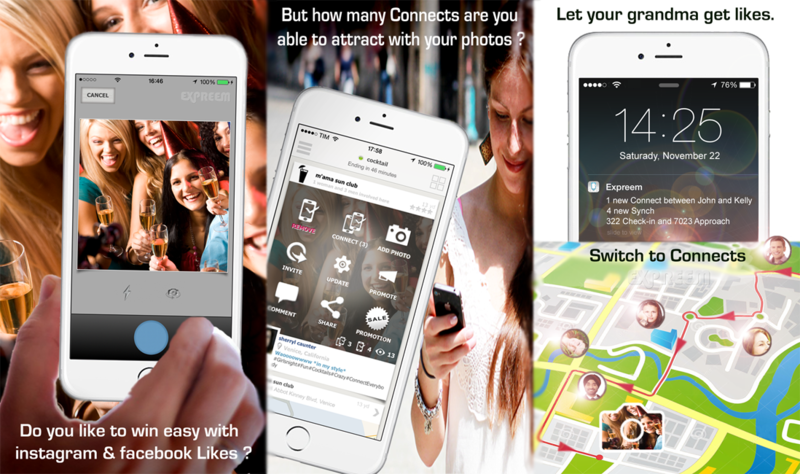 Capture Moments: With Path you can capture and share all of life’s most important moments: photos, videos, thoughts, places, music, TV shows, movies, books, workouts, and sleep. Be Yourself: Create and edit beautiful photos and videos with our world-class creative tools and filters. Control Privacy: You’re always in control of your privacy on Path with settings that are simple and easy-to-understand. Get More Than Likes: With Path Emotions you’ll get more than likes from your family and close friends —smiles, frowns, laughs, gasps, or loves. Also: never again wonder if a friend saw your post, because with Path you can see everyone who has. Search Moments: Revisit any of your Moments by searching for friends, birthdays, places, cities, holidays, months, seasons, and more. Share Everywhere: Easily share any of your Path Moments to Facebook, Twitter, Tumblr, Foursquare, and WordPress. Apps & More: Your favorite apps work with Path too. Share your Nike runs, Strava workouts, VSCOcam photos, WordPress posts, and more. Swipe right to like or left to pass. If someone likes you back, it’s a match! Chat with a match or snap a photo to share a Moment with all of your matches at once. It’s a new way to express yourself and share with friends. * Personalized Introductions – Get set up with singles we believe you’re more likely to be attracted to and interested in. * Verified Photos – Zoosk is the only dating app that allows members to use Zoosk Photo Verification to verify that their photos look like them. * Chat and Messaging – Chat with other members in real time to get to know each other better before dating. * Sophisticated Matching – Let SmartPick™ set you up with someone using advanced Behavioral Matchmaking™ technology. * Trusted Service – Zoosk is a Better Business Bureau (BBB) accredited business. Banjo is your all-access pass to live events and breaking news around the world. We discover social posts from your favorite networks, sort them by location, and show you what it’s like to be anywhere in the world, right now. Browse music, sports, breaking news, and so much more to explore real-time posts from the people who are there. Banjo provides an on-the-ground view at any place or event. Circle – Events, Concerts, Happenings & Free Stuff in Your Town! Voted the #1 App to Find The Best Things to do Today, Tomorrow or this Weekend! Events, Concerts, Family, anything. Featured by Apple as a top New App. Seen in Huffington Post, Fast Company, TechCrunch! Find FREE, Events, Meetups, Concerts, Active, Chill, Family, or Budget-Friendly things happening nearby. No login required, just get started immediately. By alerting you to friends and like-minded people nearby, Sonar reveals small world moments you’d have otherwise missed. Seen in the New York Times, CNN, TechCrunch, Mashable, Fast Company, The Atlantic, TIME, Financial Times, Ad Age & more. Sonar is the best way to connect & share with the people here now. Use it everywhere! ✔ You’re in control – pause anytime! Featured by hundreds of publications around the world! Highlight is a fun, simple way to meet interesting people nearby and see how you’re connected to the people around you. If someone standing near you also has Highlight, their profile will show up on your phone. You can see their name, photos of them, friends and interests you have in common, and any other information they’ve chosen to share. Highlight works with you wherever you go. At the office, it might notify you that a nearby coworker knows your close friend, or that a client you’re going to meet has similar interests in music. When you’re socializing, it helps you remember people’s names and know who to talk to at a conference or meet up. As you walk around town, the app runs quietly in the background, finding connections you have to others nearby. If your friends are close by, it will notify you so that you can meet up with them. If interesting people are around, it will tell you why they’re interesting, and what connections you have in common with them. If someone close by has similar interests or close friends in common, it will notify you. Highlight gives you a sixth sense about the world around you – showing you interesting friends nearby and allowing you to connect with and meet similar people around you. With Highlight, we hope you find that your days are more fun, the places you visit are more interesting, and the friend connections you make are more memorable than ever! Ready for a new way of getting to know people? Get LOVOO’s Live Radar for your smartphone now and find people nearby to connect with! Millions are already using it! You’ll love it! Rated as one of the top social discovery networks for it’s sleek interface and ability show people in your direct vicinity, LOVOO opens up a world of possibilities. Try it out now and discover that with LOVOO, unrequited winks in a cafe or fruitless attempts at starting conversations in clubs can be a thing of the past! √ Register for free via Facebook, Twitter or e-mail! The Live Radar updates in real-time so you can quickly contact people who catch your eye- they might be just a few streets away. Find out what’s going on at your favorite club before you’re even there. Chat and meet up in a cozy cafe. Find the person who makes your heart beat faster. Enjoy the AD-FREE version of Skout, the global network for meeting new people. NO ADS, all fun! Simply download Skout+ and your existing Skout account, profile and chats will automatically carry over. Expand your social network with the tap of a button. It’s so much fun, you won’t be able to stop. Start Skouting and find your party, make new friends, or meet new people, anytime, anywhere.